The PSW-ECO is a heavy duty stretch wrapper suitable for high volume production applications. Its state of the art PLC will allow user to expect efficiency and consistency in every wrap. Independent programming for number of wraps on top and bottom of pallet, speed control for turnable, and film carriage. The Power Pre-Stetch mechanism will allow users to obtain maximum film savings. 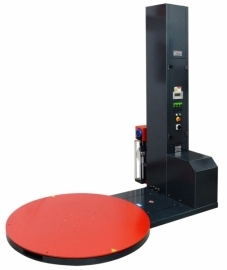 The PSW-ECO includes sensors to detect pallet height. Loading ramp available (optional). Pallet Stretch Wrapper with Power Pre-Stretch, up to 250% Savings in Material.